Geneva Dentist | Are Porcelain Veneers Right For You? Home » Blog » Are Porcelain Veneers Right For You? Whether you have sustained tooth damage or discoloration, porcelain veneers can help improve your smile. Imagine being able to create your ideal smile- porcelain veneers can be custom designed to match your cosmetic needs. At Khanna Dentistry, we offer a full range of cosmetic services, including porcelain veneers. Geneva dentist Dr. Neeraj Khanna will work with you to determine if porcelain veneers are right for you. Porcelain veneers are thin ceramic shells that permanently attaches to the front and side of the teeth. Porcelain veneers can be shaped, molded, and color matched to blend with your existing teeth. We ensure our patients are comfortable, relaxed, and safe throughout their treatment. Patients may receive a numbing agent to ensure they are comfortable throughout their procedure. For patients with extreme cases of dental fear, we may discuss your sedation dentistry options. Our team will asses the condition of your teeth to determine if porcelain veneers are right for you. 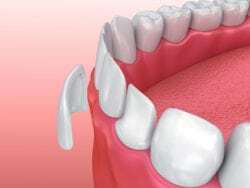 If porcelain veneers are not right for you, we may suggest dental bonding to enhance your smile. Proclaim veneers can be used to address gapped teeth, broken teeth, chipped teeth, discolored teeth, and crooked teeth. The whole porcelain veneers process takes about 2-3 weeks. The process includes treatment planning, preparation of the teeth, and bonding of the porcelain veneers. Patients should brush twice a day and floss daily to keep their porcelain veneers clean. Try to stay away from foods and habits that may lead to broken veneers. To learn more about porcelain veneers, schedule a visit to our Geneva dental office. We can work with you to find the right solution for your smile! To schedule an appointment, call 630-225-7164 or request an appointment online.